Swoon! Congrats to you, beautiful… this was a lovely way to tell us about your news. The most beautiful place in the world- I love the sentiment. Thank you for sharing! Thank you, Amber – it feels so good to share the news! I wanted to share pictures from the celebration, but alas, we don’t have them from the photographer just yet. I so loved reading your wedding post, and the recent one about your visit to Sundance. How absolutely romantic and wonderful that must have been – and so special that you two have that spot to come back to year after year. Cheers to us both being newlyweds! Can’t wait to see your photos! Yay, newlyweds! This entry is honest and beautiful. I’ve seldom subscribed to the Hubba-Hubba School of Romance; though, there was a period betwixt ages 17-19 in which I thought romance was not only cosmic, but earth moving in each and every moment. I now know that it is in the day-to-day, in the growing, and the choosing that love grows. The Hubba-Hubba stuff is so very lovely in the beginning, and of course there are times when I miss our endless date nights and my butterflies. But wow, the “real” stuff is pretty awesome. I’m so glad you and I have both arrived at a more realistic perspective. I think the Earth can move itself just fine without help from our love affairs, don’t you think? Cheers to sharing the day-to-day sweetness! I prayed for you, friend! Hope the wedding was precious and wonderful. Looking forward to pictures! I love the sweet simplicity of referring to my husband as Husband and I feel warm all over when he calls me Wife. 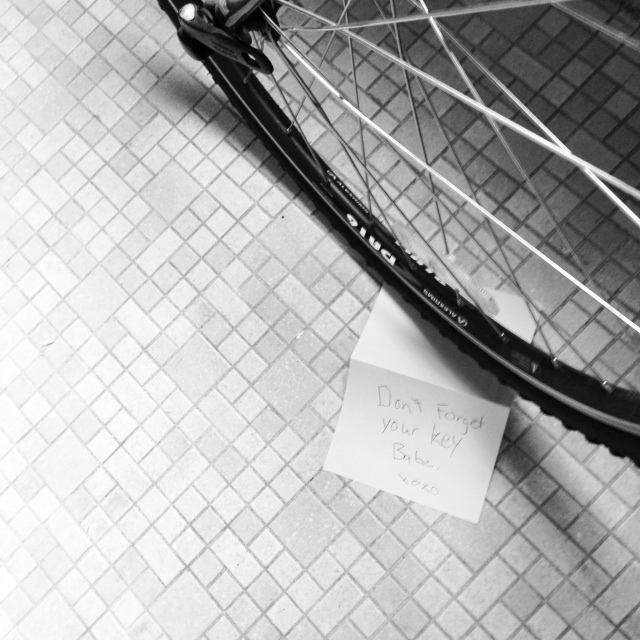 The bicycle note is such a real and perfect example of life in marriage, in relationship. Mine, in many ways, has boiled down to a sharing of help, sacrifice, and honest exchange. Such a powerful, beautiful thing. Rejoicing with you! The wedding was wonderful, Jane – thank you for your prayers! There truly is some magic in hearing those words, isn’t there? I think you’re absolutely right that relationships boil down to a simple blend of basics. But it certainly can be easier said than done to maintain, which I suppose is where the growth and the grace come into play. Hooray for us both having June anniversaries – we can rejoice together! As much as I hate to hamstring such a lovely, well written, heart-filled blog post, I need to inform you that Barbara just usually can’t remember my first name. I love this! Congratulations! I got married on June 15th, and went from having a husband-type-person to an actual husband. And he’s my husband. We too greet each other with our new titles, because it’s the truth, and we still need to get used to it, ha! Congratulations to YOU, Lorna! A “husband-type-person” is exactly what it felt like up until this point. Introducing him as “my boyfriend” didn’t feel right after a certain stage in our relationship, so it feels great now. I’m also loving this stage of not planning for the wedding anymore – I’ll take a sigh of relief for us both for having jumped that hurdle! Cheers to June nuptials! Dearest Katie: Reading this lovely piece makes me happy and optimistic about the future of your loving family. Sharing your life with the right person adds richness to everything you do and everywhere you go. I’m sending you wishes for all possible happiness. Thank you, Carol. I like the term “richness” to describe what it feels like to share life through marriage.